Pavlos Philippou is an architect involved in practice, teaching and research. He has taught at the AA, while his work has been published and exhibited internationally – especially a winning Europan entry. Apart from his PhD, Pavlos has completed both his Diploma and MA (Housing & Urbanism, Distinction) at the AA. Beginning in the late nineteenth-century and becoming codified by the early twentieth, cultural buildings came to acquire a salient role in urban reasoning. Cultivating Urbanism pursues the architectural richness of this reasoning through a set of distinct but interrelated case studies, which exemplify the themes and strategies linking cultural buildings to the spatial politics of the liberal metropolis. Seen in their relation to a complex and persistent urban discourse, the cases allow us to see both the continuities as well as the dynamism and differentiation that architecture brings to the urban field. In terms of organisation, the thesis is divided in three parts. The first initially argues for a renewed attention to typology, which sidesteps the conventional ways of approaching type – as rooted in taxonomic, symbolic, or programmatic characteristics. Instead, it is about thinking in groups and series though diagrammatic terms. This is furthered in respect to an investigation of cultural buildings as primary elements within urban areas. 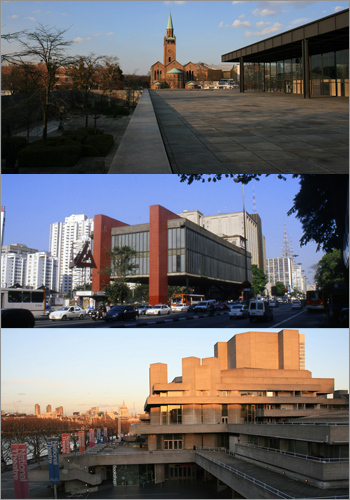 The second part is comprised by respective typo-morphological examinations of the dissertation’s three primary case studies – namely, Ludwig Mies van der Rohe’s Neue Nationalgalerie, Lina Bo Bardi’s MASP, and Denys Lasdun’s National Theatre. Finally, the third part operates as an appraisal of the present organisation of the field, via an exploration of a recent, prominent case: Frank Gehry’s Guggenheim Museum (Bilbao). Ultimately, it is argued, while there is a robust proclivity in terms of architectural experimentation upon cultural buildings, there seem to be fewer impulses to exploit urban possibilities with them.